A new series of postage stamps depicting subjects of Archaeological and Historical interest was introduced and put on sale on and from 15th August 1949 - the second Anniversary of India’s Independence. These stamps constitute Free India’s first series definitive stamps and were intended to replace King George VI stamps, although both would remain on sale concurrently, until stock of the latter were exhausted. A special Independence Day Cover was put on sale from 8th August 1949 and the price of such cover was 1 Anna each. A special cachet which would be used exclusively on the day the new stamps were brought out, had been supplied to the following Post Offices, vide Postal Notice No.23 dated 5th August 1949. As August 15, 1949 was a public holiday, the sale of these stamps was confined to certain selected Post Offices only. The new stamps were also sold at the Stamp Agency in the office of the High Commissioner for India, London. A short description of each stamp, which are in 16 denominations. Registered News Paper not exceeding 10 tolas. Fee for the Certificate of Posting. The Blind Literature Packets upto 2 lbs. for Inland & Foreign. Printed Papers & Sample Packets for Inland & Foreign. Late fee for RMS carriage. Commission for each Postal Order. Sample Packets - first 2 oz. Money Order Commission for first Rs.10/-. Foreign "Acknowledgment of Delivery" Fee. Air Mail Post Cards for Persian Gulf Countries. Business Papers first 10 oz., by surface route. Insurance Charges for first Rs.100/-. Foreign Insurance Fee for every 20 pound. Air Fee for Inland air Parcels. High Value - mainly used for Telegraphs & heavy Parcels. In this Archaeological series, a supplementary issue became necessary as “Bodhi Sattava” statue was wrongly shown reversed (left hand raised instead of right hand) in 1 Anna value, which was rectified by a fresh issue on July 15, 1950. Second supplementary issue became necessary, when foreign Postal rates were increased for surface route from 1st December 1950. The rate for Post Cards was increased from 2 Annas to 2½ Annas and for Letters 3½ Annas to 4 Annas. 3½ Annas stamp was withdrawn and 2½ Annas stamp was issued in the same design as 3½ Annas stamp but in lake colour. 4 Annas stamp was reissued in same design but in blue colour, because the convention of Universal Postal Union says that stamps showing Sea Mail Postage should be in blue colour. These stamps were released on 30th April 1951, vide Postal Notice No.4 dated 19.4.1951. Rs.10/- stamp is found in two different colours. The first one is purple brown & deep blue and the second is purple brown & blue. Forgeries in 8 Annas and Re.1/- value are known. Re.1/- forgery was emanated from Nepal and is very scarce. Nothing much is known about 8 Annas forgery except it was reported by Mr. Jal Cooper. World Stamp Exhibition BRASILIANA-2013 is being held in the city of Rio de Janeiro, Brazil, from 19 to 25 November, 2013. The event is jointly organised by the Brazilian Enterprise of Posts and Telegraphs (ECT) and the Brazilian Federation of Philately (FEBRAF). It sponsored by the International Federation of Philately (FIP), with the support of the Inter American Federation of Philately (FIAF). During this exhibition two major events of Brazil are also celebrated (i) 350 years of establishment of Brazilian Postal Service and (ii) Introduction of 170 years of the “bull’s eyes”stamps. In this exhibition maximum number of Indian Philatelists participated and following philatelists have won awards in the exhibition. We congratulate all Indian Participants who have won awards at the BRASILIANA-2013 - World Stamp Exhibition. I also congratulate following philatelists from Canada, Czech Republic, Kuwait and Pakistan, who exhibited collections on Indian subjects in the exhibition and have won awards. I take this opportunity to share with you my editorial published in 'Vadophil' Issue no. 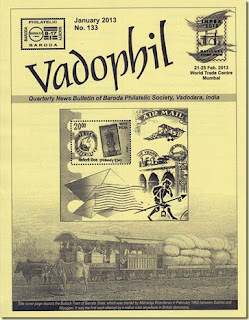 133 (Quarterly News Bulletin) of Baroda Philatelic Society of Vadodara, through my blog to have an attention of philatelic fraternity about the attitude of Department of Posts towards philatelists. Readers are requested to send their comments / feedback and also share their experiences. In the editorial of Vadophil (Issue no. 131-132, Jul.-Oct. 2012), it was stated that “Organised Philately is often linked to a three legged stool; the three legs are philatelists, trade and postal administration”. Geometrically, three legged stool is very stable even if three legs are of un-equal lengths. In terms of philately, legs could be interpreted as contribution to the promotion of philately. We need to review the third leg of stool i.e. Postal Administration, which is most important but unfortunately having a cracked leg. A while ago Department of Posts released a glossy and colourful philatelic magazine “Phila Post” with a great funfare in Delhi. Many philatelists from Gujarat and elsewhere from India and, of course, PCI members attended the meeting. Loud announcements were made on the future course of action to promote philately in India and regular release of the magazine through philatelic bureaux all over India. After couple of issues magazine had gone in hibernation. During GUJPEX-2011, state level philatelic exhibition held in Vadodara, a plenty of unpleasant matters came to light. During the Valedictory function, except for the Sr. Jury member, none of other jury names were acknowledged. Senior Philatelists who conducted a workshop on philately, quiz programs etc. were ignored. Normal courtesy demands that they should have been honored with mementoes for their contributions. Even they were not invited to seat in the front row as gesture of courtesy. And the height of adamant attitude of Department of Post was to ignore services of members of Baroda Philatelic Society who supported, co-operated and helped the Department of Post towards organising the ‘GUJPEX -2011” from the day one of announcement of event and till the last day of exhibition. None were acknowledged personally or even during vote of thanks at the valedictory function. Volunteers of Baroda Philatelic Society stood by the department as if the event is organised by Baroda Philatelic Society, who even helped in erection of frames, mounting and dismounting of exhibits even after such step motherly approach by the Dept. of Posts at the end of exhibition. For what ? For the sake of love for Philately ? Recently Vadodara East Division organised District Level Philatelic Exhibition “VADOPEX 2013” at Vadodara from 10th to 12th January 2013. During the planning of this exhibition Baroda Philatelic Society was approached by the Chairman of Exhibition in the first week of November 2012. At that time Baroda Philatelic Society had requested the officer to convey the message about the grievances and unhappiness of members of the society who had unpleasant experience during the last GUJPEX-2011 to the concerned authority. It was never conveyed to higher authorities and the society members were kept in dark about this. 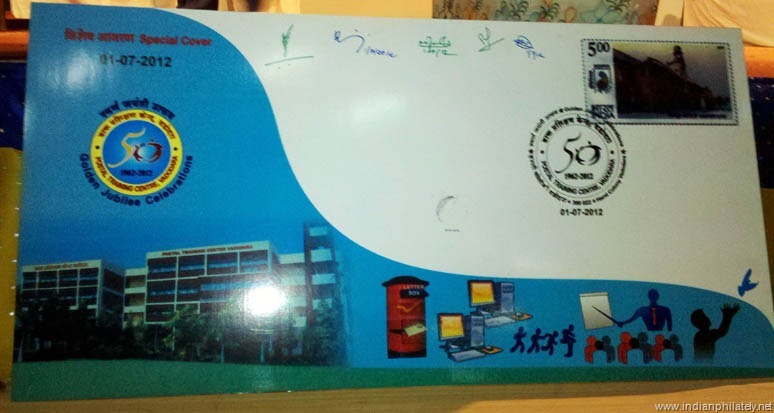 It reduced the enthusiasm among the members of Baroda Philatelic Society towards Vadopex 2013. Organisers of Vadopex 2013 remain silent till last week of December 2012 for reasons best known to them and in the end of December 2012, hardly 12-15 days before the inauguration of Exhibition, sent entry forms and one page announcement letter about Vadopex 2013 to couple of philatelists of Vadodara. Phone calls were made to philatelists to participate in the exhibition and personal approaches also made to collect entries for exhibition but members of Baroda Philatelic Society were not in mood of participating in the exhibition due to unpleasant and adamant attitude of the organisers. The Prospectus of Vadopex 2013 reached us separately by Post on second day of Exhibition!!! Even the PDA account holders were also not properly communicated about the event. Surprisingly for the first time in history of philately, two types of prospectus were seen. One was showing text “The exhibition is organised by the East Division with the active support of Philatelic Association of Vadodara.......” and another with white ink obliterating this text !!! For us, 10th January 2013 will be known as Black Day in Philately. 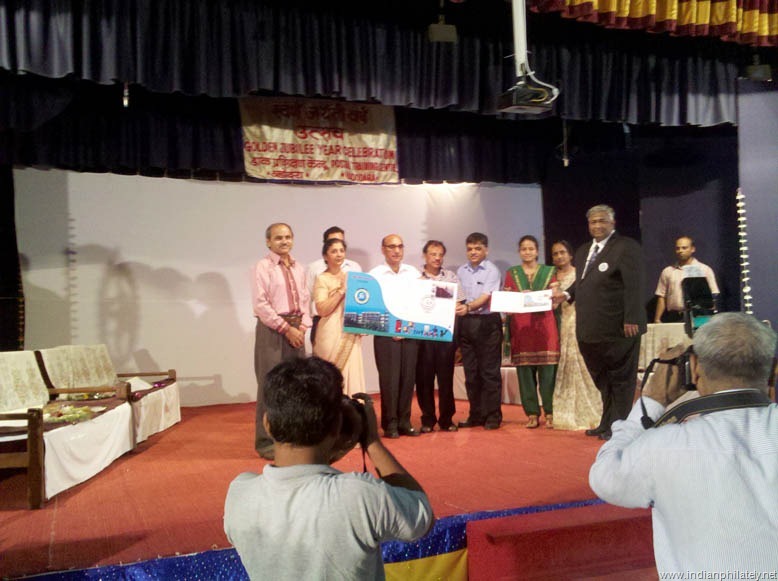 Vadopex 2013 held in the city of Baroda was inaugurated without presence of members of Baroda Philatelic Society. Even there was no advertisement about the event in local news papers or TV Channels and media personal did not attended the event. Fifteen frames were exhibited in Adult Class, 26 frames were exhibited in Youth/School class, 27 frames were exhibited in Invitee Class from non members of Baroda Philatelic Society and, some frames obtained from outside Baroda. Appointment of members of Jury for the exhibition is also a mystery and reason behind appointing them is best known to Department of Post. Jury members appointed for Vadopex 2013 have never judged any philatelic exhibition even as an apprentice jury. Family member of one of the jury was a participant in competition class and has been awarded a Silver medal ! Is this justified ? Is this as per India Post Regulations for Judging ? This is a serious matter and need a serious attention by higher authorities of Philately Division of India Post. Though the event was of three days, three special covers were released on very first day. Why one each special cover was not released on each day of exhibition? Traditionally, on each day, one special cover is released during the exhibition to attract more visitors on each day. After the introduction of ‘My Stamps’ at INDIPEX 2011 International Exhibition it has become a tradition to provide my stamps facility at district level philatelic exhibitions which not only attracts philatelists and visitors but also generates good revenue for the Department of Posts, but at Vadopex 2013, no such facilities of ‘My Stamps’ were provided. There was another surprise. Stamps issued to commemorate the 150th Anniversary of Swami Vivekananda are still not available at many philatelic counters. But sheets were taken to the venue of the exhibition, in spite of the fact that very limited supply was received by Vadodara Philatelic Bureau. Thus depriving other philatelists of neighbouring towns. We are awaiting explanation from Dept. of Posts, Vadodara. Don’t you feel that district level philatelic exhibitions are merely for the submission of Annual Reports to the higher authorities and audit purpose and just to waste the philately budget sanctioned by Philately Division? The district level philatelic exhibitions are absolutely necessary but they should be planned well in advance and senior philatelists and local philatelic organisations should be taken into confidence and involved right from the beginning. It appears that Department of Post has shrunk from the responsibility of organising philatelic events. During last one year there was no philatelic activity in Vadodara even on Philately Day which was celebrated everywhere with a great enthusiasm with the support of philatelists and philatelic organisations across the country. Now you can understand the cracked up third leg of the stool. Patch up will not serve the purpose. It has to be replaced. Fresh wind is required to disperse the cloud and bring the philately under a bright sunshine. When I say “fresh wind”, I mean change or more precisely, overhaul of the system. We need to look for a good carpenter so that the stool can stand on its three legs well balanced. The King’s hobby will only survive if we pray “God Save the King”. Having said that let us say “God save this hobby”. 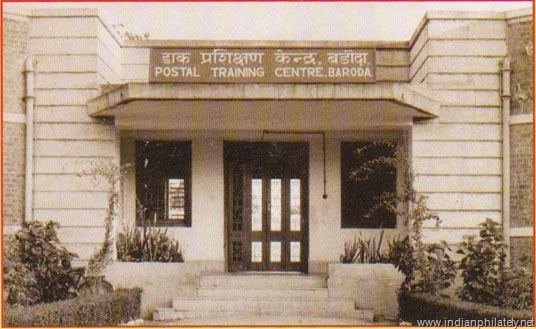 Postal Training Centre, Vadodara was established on 01.07.1962 to cater to the training needs of postal employees of Gujarat, Maharashtra and Madhya Pradesh postal circles. The centre started its functioning from rented accommodation provided by the Government of Gujarat in the premises of Mental Hospital, Karelibaug, Vadodara. 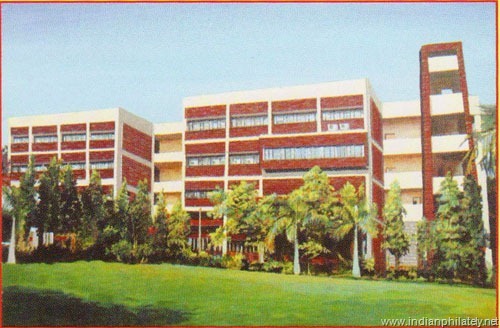 There after the centre was relocated to its present premises, opposite to Airport, Harni Road, Vadodara, in 1985. The centre is presently catering to the training needs of Gujarat, Maharashtra, Madhya Pradesh and Chhattisgarh Postal Circle and to the officials from other circles also from time to time. The aims and objectives of this training centre is to impart induction, in service and refresher training to postal assistants, sorting assistants and inspector posts with a view to upgrade their knowledge and skill and to train the officials in computer application so as to equip them in software and hardware. Initially this training Centre was imparting training on operational procedures of traditional services of India Post and now in addition to traditional service, training on operational procedure of premium products and software of India Post is also conducted by using modern equipments. Today this training centre has a capacity of handling more than 1,00,000 (One Lakh) trainee days in a year. 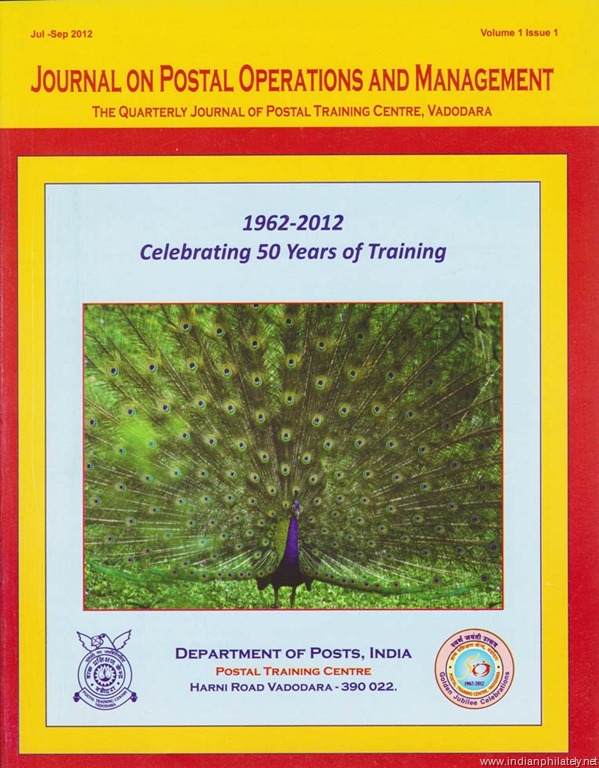 On the occasion of Golden Jubilee of Postal Training Centre, Vadodara, a special cover was released on 01.07.2012 in a function organised at Padmini Sabhagruh of Postal Training Centre. Shri Kamleshwar Prasad, Member (HRD), Postal Services Board, New Delhi released the special cover. 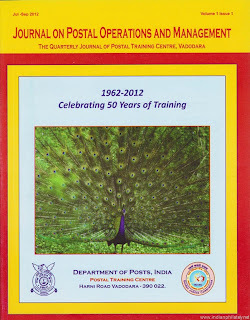 Postal Training Centre has also started publication of a quarterly journal ‘Journal on Postal Operations and Management’. 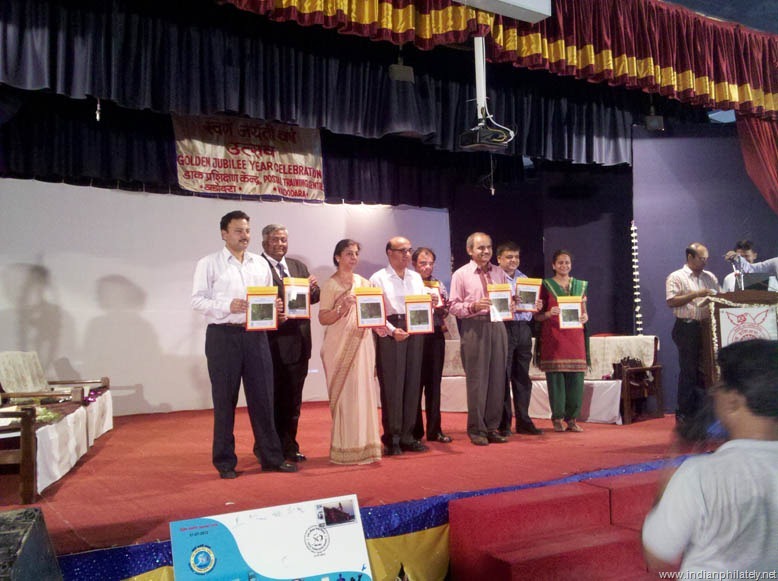 Inaugural issue of journal was released on the occasion. Shri Ganesh V Sawaleshwarkar, Director of Postal Training Centre, Vadodara briefed about the history of the Postal Training Centre. Shri A. K. A. Joshi, PMG, Vijaywada and Ex. Director of PTC, Vadodara, Smt. V. T. Sheth, Retired CPMG, Gujarat Circle and Ex. Director, PTC, Vadodara also attended the function. Other dignitaries present on the occasion were PMG, Vadodara, PMG, Rajkot, DPS, Vadodara and DPS, Ahmedabad. In continuation to Shri Ashok Kumar Bayanwala’s article Lapses in Speed Post Tariff 2012, I did some research on the Speed Post charges levied for Local and One India One Rate Speed Post articles and have found interesting information on the Service Tax charged at various post offices. Here are some interesting examples from various post offices, before change in Service Tax rate and after changes in Service Tax rate. Ahmedabad RMS: Service Tax Charged Rs. 1.11 (@ 10.30%) thus basic postage rate charged Rs. 10.89. Lashkar HPO: Service Tax Charged Rs. 1.15 (@ 10.30%) thus basic postage rate charged Rs. 10.85. Here there is difference in the Service Tax charged which make anomaly in basic rate of local Speed Post Tariff. 2. Ahmedabad RMS (18.04.2012), Speed Post rated Charged Rs. 13.00. Service Tax Charged Rs. 2.15. Basic postage rate Rs. 10.88, If Service Tax charged at 12.36% it should be Rs. 1.34. Thus the total becomes Rs. 12.22. That means Rs. 0.78 Charged extra as rounding off. How the Service Tax mentioned as Rs. 2.15 is a question. As per roll back to Rs. 12 from Rs. 13 for Local Speed Post tariff Rs. 12 have been charged. Service Tax charged is Rs. 1.32, thus the basic postage rate becomes Rs. 10.68. Service Tax Charged Rs. 2.33 (@ 10.30%) thus basic postage rate charged Rs. 22.67. Service Tax Charged Rs. 3.36. Basic postage rate Rs. 22.67, If Service Tax charged at 12.36% it should be Rs. 2.80. Thus the total becomes Rs. 25.47. That means Rs. 0.53 Charged extra as rounding off. How the Service Tax is mentioned as Rs. 3.36 is a question. As per roll back to Rs. 25 from Rs. 26 for One India One Rate tariff of Rs. 25 was supposed to be charged (as per above example) but here Rs. 26 has been charged. Service Tax charged is Rs. 3.36. After increase in Service Tax rate w.e.f. 1st April 2012, the Business Development & Marketing Directorate of Department of Posts, vide their letter no. 57-10/2011-BD&MD dated 04.04.2012 issued instructions to implement the revised Service Tax rates wherever it is applicable in respect of Premium Products of India Post and to take immediate action for change of the rate of Service Tax in the software. As per this guideline most of the post offices updated their software resulting increase in Local Speed Post rate from Rs. 12/- to Rs. 13/- and One India One Rate from Rs. 25/- to Rs. 26/- without keeping in mind that local and ‘One India One Rate’ tariff declared by India Post are flat rates which are inclusive of Service Tax. While checking on website of Postal Training Center, Mysore, it was revealed that a special guideline was issued on 9th May 2012 for charging Service Tax for Local & One India One Rate Speed Post articles. The guideline on the website mentions that in order to keep the Local Speed Post rate for the weight slab of 1-50 Grams as Rs.12/- the speed post rate should be fixed as Rs.10.67 as basic postage plus 12.36% Service Tax which is comes to Rs. 1.32 (Rs. 0.01 would be rounding off value) which makes total of Rs. 12 as Local Speed Post rate. Similarly to keep One India One Rate for the weight slab of 1-50 Grams as Rs. 25/- the basic postage rate should be fixed as Rs. 22.24 plus 12.36% Service Tax which comes to Rs. 2.75 @ 12.36% (Rs. 0.01 would be rounding off value) which makes total of Rs. 25 as One India One rate. Earlier when the Service Tax was 10.30% the basic postage rate for Local Speed Post was Rs. 10.88 and the Service Tax @ 10.30% was Rs. 1.12. Similarly for One India One Rate the basic postage rate was Rs. 22.67 and the Service Tax @ 10.30% was Rs. 2.33. Thus to keep the existing tariff of Local and One India One Rate for Speed Post articles after the increase of Service Tax, India Post has reduced the basic postage rate of these two classes. Even after notifications and guidelines issued by India Post and Postal Training Center, Mysore many post offices continued to charge Rs. 13/- and Rs. 26/- for Local Speed Post and One India One Rate Speed Post articles. Examples of Racecourse P.O. dated 21.05.2012 are live examples. And opposite to that many post offices did not updated their software with new service tax rate and kept on charging 10.30% Service Tax. Here is the example of Tajnapeth Post office in Akola who charged 10.30% Service Tax. Other two recent examples are from Shamshi P.O. (Himachal Pradesh) dated 21.05.2012 and 05.06.2012. Total Postage is charged as Rs. 25 but in both cases Service Tax is charged as 2.33 i.e. 10.30% Service Tax is charged on the basic postage rate of Rs. 22.67. That means till 05.06.2012 Shamshi P. O. was charging 10.30% Service Tax. One more interesting point noted is the rounding off pattern used by India Post. In all financial transactions rounding off to rupee is done on lower side if paisa value is below 50 paisa and rounded off to next rupee if the paisa value is above 50 paisa. e.g. if the value is Rs. 12.22 or even 12.49, normally it is rounded off to Rs. 12.00 and if the value is Rs. 12.51 or above it is rounded off to Rs. 13.00. While in case of India Post even the value is Rs. 12.22 they round it off to Rs. 13.00. Here is an example of Speed Post article booked from Vadodara to Patna on 06.06.2012. Speed Post charge for the slab of 51 to 200 gms for 1001 to 2000 km is Rs. 50. On Rs. 50 Service Tax at 12.36 % becomes Rs. 6.18 thus total rate becomes Rs. 56.18. Here the service tax is shown as Rs. 7.00 and total Rs. 57 has been charged. Another example is from Shamshi P.O. dated 03.05.2012. On the rate of Rs. 30, 10.30% Service Tax is charged which comes to Rs. 3.09 but in receipt Service Tax is mentioned as Rs. 4.00. Conclusion: Mr. Ashok Kumar Bayanwala has rightly said that “Be alert and keep your eyes open”. I found above discrepancies in Speed Post rates and Service Tax charged. Dig the well and you will also find more interesting things about lapses of India Post.